Billy Graham, who died last week at age 99, conducted his first city-wide crusade in 1947 in Grand Rapids, Michigan. He held more than 400 crusades in 185 countries, speaking in person to 215 million people! Ten times as many — 2.2 billion people — heard him on radio or TV. No one in history brought the Christian message to so many. He lay in state Wednesday and Thursday in the U.S. Capitol. His burial is today. The U.S. House and Senate closed down in his honor. 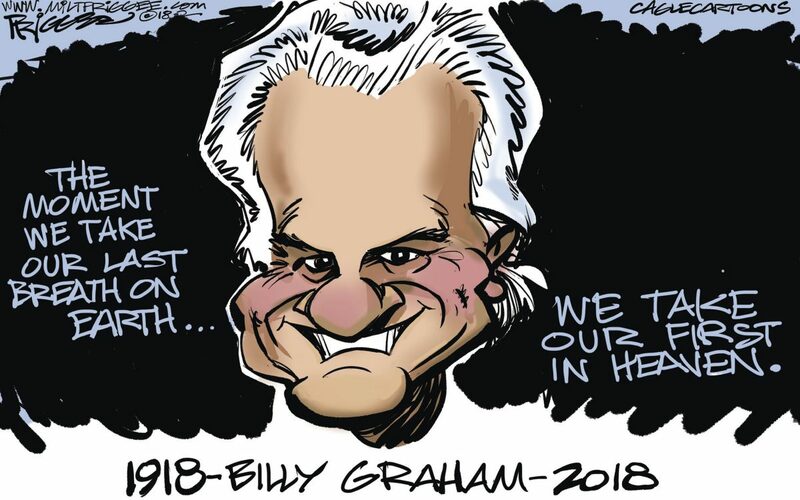 House Speaker Paul Ryan said, “If there is anyone whose life deserves to be honored by lying in the U.S. Capitol, it’s Billy Graham.” Thousands of people — some who had driven for hours — filed past the man who changed their lives. Millions of individuals experienced a similar life-changing experience. One was George W. Bush when he was in his 20s, and drunk. His father, George H.W. Bush, had invited the preacher to the family’s compound in Maine, and he spoke with the errant son. That conversation led the younger Bush to quit drinking altogether, and put him on the path to the presidency. President Harry S. Truman was the first of 12 presidents who invited Graham to the White House. After meeting with Truman, the media asked him to recount some of their conversation. Graham and his colleagues knelt on the White House lawn for prayer. Graham went to great lengths to avoid moral failure. He never had a meal with a woman other than his wife. He required his hotel room be searched before he retired. He handled money ethically. The Billy Graham Association handled over $100 million a year and never once had a financial malfeasance allegation. Graham helped create Christianity Today, the definitive magazine of evangelical Christianity. The magazine reported that Graham persuaded more than 3 million people to commit their lives to Christ. One of those people was Don Wildmon, who created the American Family Association, which owns 184 Christian radio stations and publishes the AFA Journal, a monthly Christian magazine. The magazine opposed a 1980s film by Martin Scorsese, “The Last Temptation of Christ,” which Wildmon called “blasphemous.” In interviews with Ted Koppel, of Nightline, PBS’ McNeal-Lehrer Report, and NBC’s Meet the Press, Wildmon urged Christians to sign a petition to theaters not to show the movie. It worked. The film made it into only 1 percent of the nation’s theaters and was a flop. Billy Graham has inspired millions of Don Wildmons to come to faith and live it for others.